WARNING: This product can expose you to chemicals including Carbon black (airborne, unbound particles of respirable size), which is known to the State of California to cause cancer, and Lead, which is known to cause birth defects or other reproductive harm. For more information go to www.P65Warnings.ca.gov. Control your audio signal level wherever you need it. The SAT-2 is a passive stereo audio device that provides you with attenuation and control over your signal level wherever you may need it, whether it be at the output of a pair of high-gain mic preamps, or before your studio speakers as a compact desktop monitor controller. Exceptional build quality and high-grade components ensure noiseless operation, without any degradation or coloration of the source material. 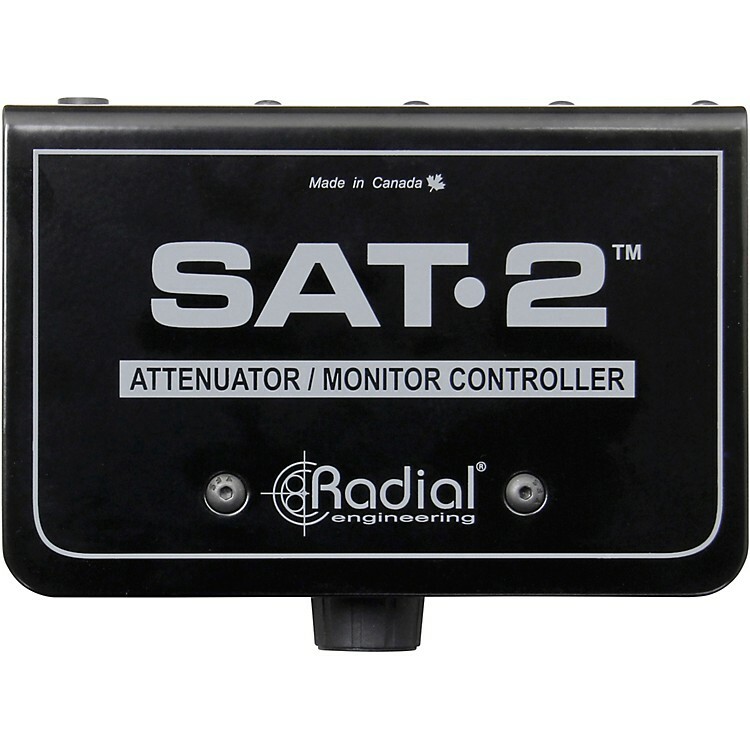 When using the SAT-2 as a monitor controller, simply connect it in between your playback device or recording interface and a pair of powered speakers. The SAT-2 is equally useful in a recording studio or with a simple PA rig to control the overall output levels. Both XLR and ¼" TRS options are provided for the inputs of the SAT-2, eliminating the need for adapter cables. XLR outputs connect to your speakers, while the trim knob provides an easy-access master volume control. Mute and mono switches allow you to silence the outputs or sum left and right together to check mixes for mono phase compatibility. A handy dim switch with adjustable level control allows you to temporarily lower the output volume without losing the setting on the main trim control. The SAT-2 can also be used to attenuate signals before sending them to your audio interface, so you can drive your mic preamps hard for coloration without clipping the inputs of the digital audio converter. This allows you to have your preamps turned up to their sweet spot without having to engage the input pad or risk overloading when recording. A high-quality 4-pole rotary knob ensures consistent L-R tracking over the entire range of the trim pot, fully maintaining the left-right balance of stereo sources. Compact but extremely rugged, the SAT-2 is housed in a 14-gauge solid steel enclosure, with a book-end design that protects the connectors and switches from damage, and I-beam construction that prevents stress on the circuit board. The SAT-2 provides clean and transparent operation with a number of useful features and applications, making it a simple yet powerful device for your audio toolbox.